Indian flat breads especially parathas are very popular in any regions of India. As an Indian, I know there are lots of different curries available in different part of India. But flat breads and rice, more specifically, paratha binds all regions together. 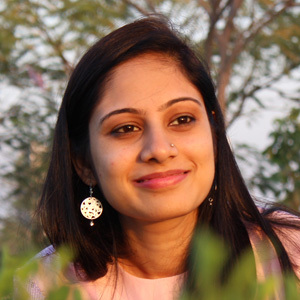 When I started my blog, I always wanted to create some international recipes with local Indian ingredients. Besides, as my journey has been 3 years now, I found out the basics of Indian cooking is more interesting. I never believed that I can make paratha recipe in so many different way. And now onwards I will share one dish which can be cooked using more than one ways. You can find my 4-ways section for more details. There are more paratha recipes are available from my kitchen. 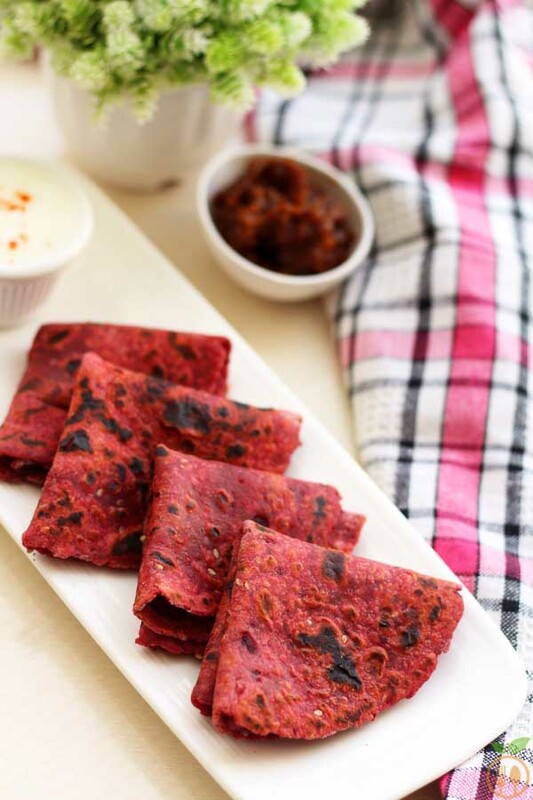 Now, This Beetroot paratha for babies is healthy one. 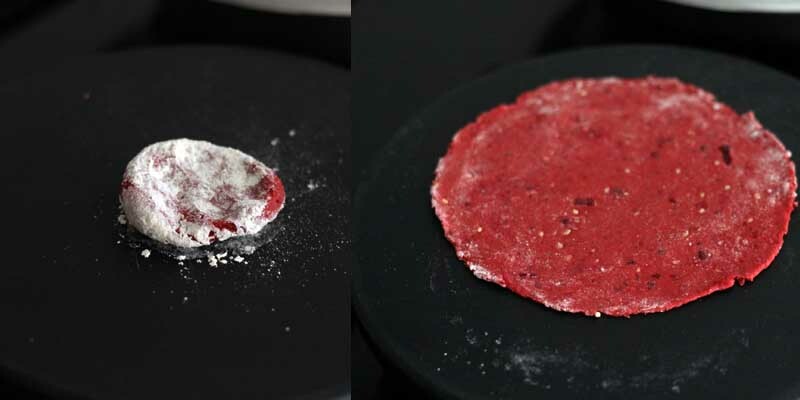 You can cook beetroot paratha by simply adding beetroot pure to it. However, beetroot has some earthy flavor, which may bother you. 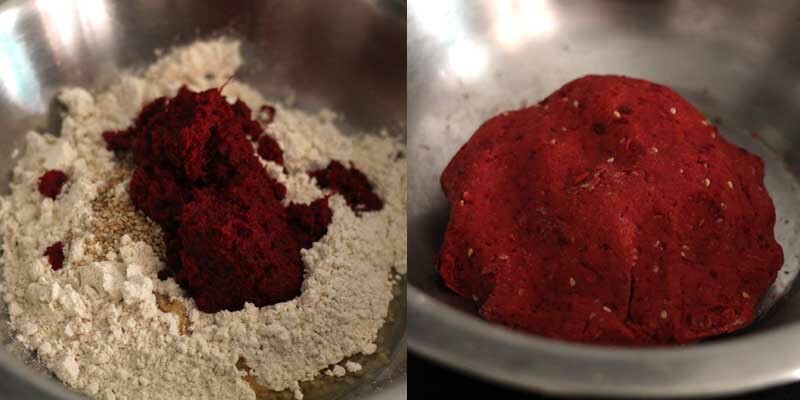 That’s the reason, I half way cook the beetroot before making pure and adding them into paratha flour. The ginger tastes awesome with beetroot and little touch of sesame seeds make it perfect breakfast recipe. 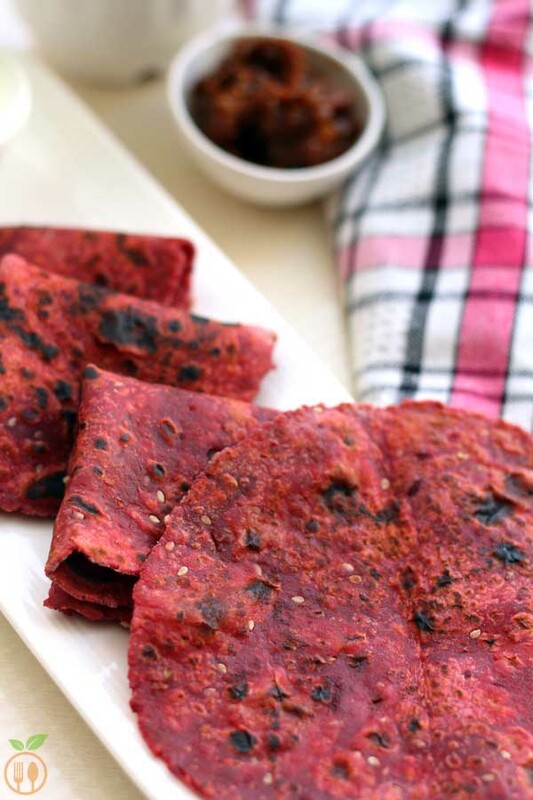 I cooked this beetroot paratha without stuffing; you can add it with aloo paratha stuffing. 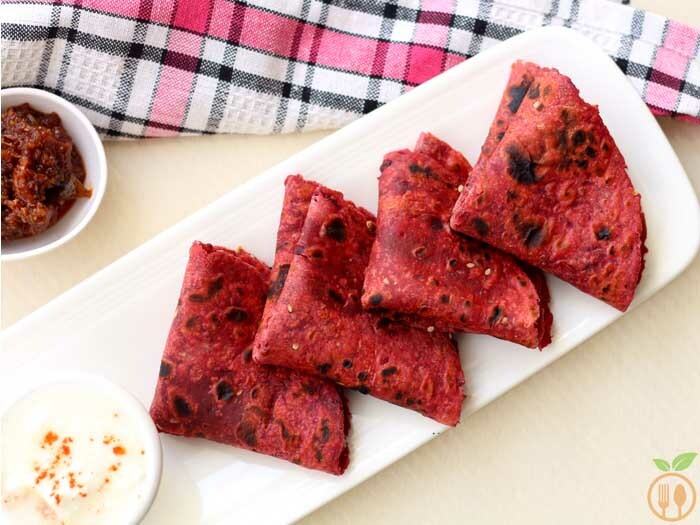 Serve this beetroot paratha as breakfast or afternoon tea snacks or even for kid’s lunchbox. It goes best with some mango pickle or curd. I prefer it with tea also. Do not cut the beetroot, I suggest grate beetroot before cooking it. Roast the ginnger and beetroot into oil. 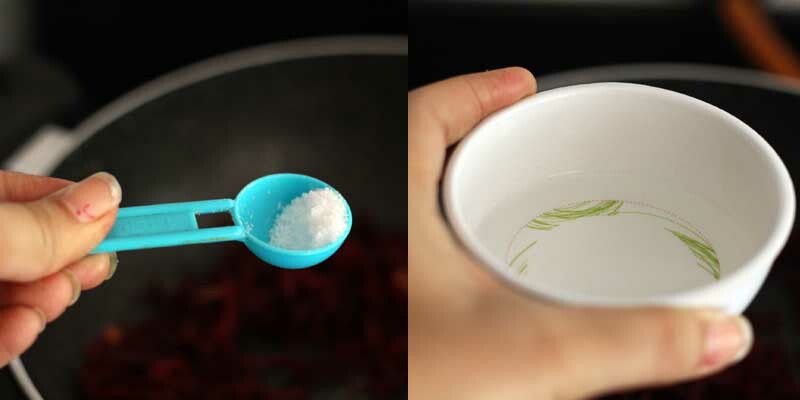 Add salt and water to cook it for 4-5 minutes. Then cook it and let it cool down, the grind beetroot to make smooth paste. 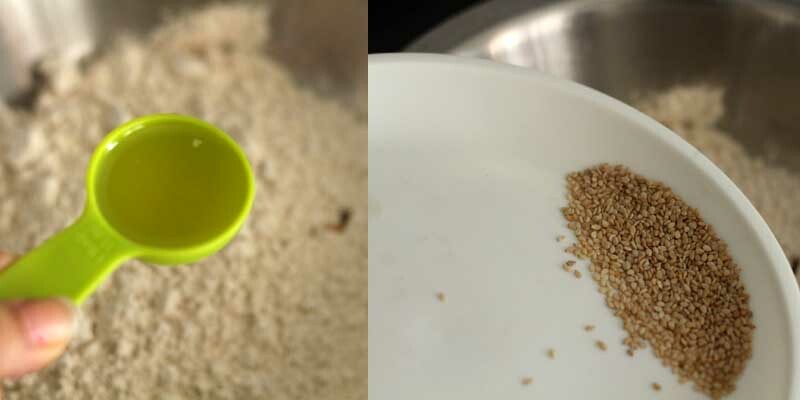 To knead the dough, use oil and sesame seeds. Now add the beetorot paste and knead the dough. Add some (2-3 tbsp) water is needed. Finally cook the paratha with oil and it’s ready to serve. 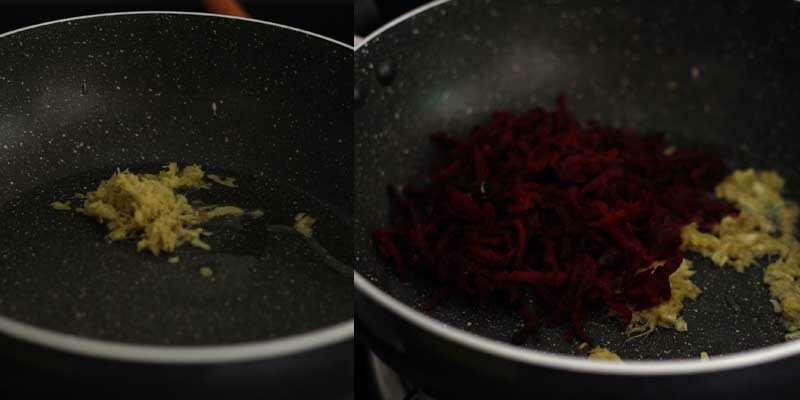 I suggest for cooking beetroot, grate the beetroot as finely as possible, this will reduce the cooking time. Avoid chopping them. You can add some cumin seeds or cumin powder while cooking beetroots. While cooking the beetroot add salt for beetroot. And making dough add salt for flour. Be careful while adding salt. Give a rest for at least 10 minutes. Take 1 tsp oil (I have used sesame oil) into pan. Ones it heated add ginger paste and cook for half minute. Then add beetroot a give a nice stir. Then add salt and half cup of water. Now cover with lid and cook for 4-5 minutes. Let it cool completely. Then grind it to smooth paste. Add 1-2 tbsp water if needed. 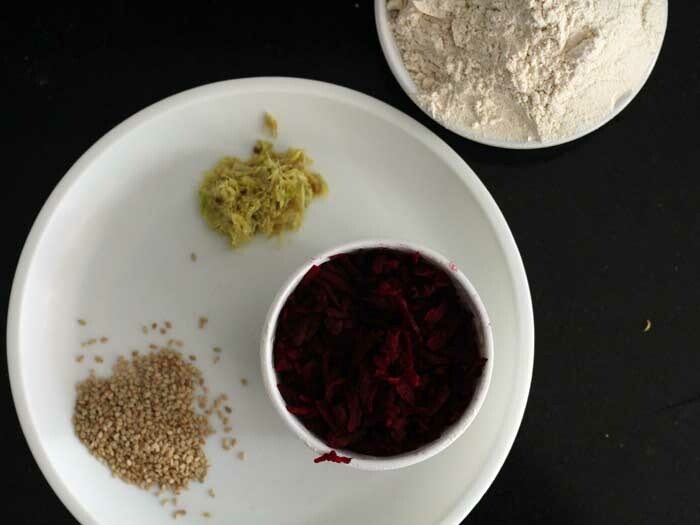 Take flour into mixing bowl and add 1 tbsp oil, sesame seeds and beetroot paste. Knead the smooth dough and give rest for at least 10 minutes. Make small round ball form the dough. You can make 8-10 balls from this amount of flour. 2) beetroot paratha is best with aloo gobi as kid's lunchbox. 3) You can serve it with any dry curry recipe. Ahh… as my sister told me recipe, it’s a allmost same. But I like this “Avoid Mistakes At First Attempt of Making beetroot paratha ” tips, and that last print section. Hay Shivang, I am glad you like it. It really taste best among all parathas. Keep visiting for more recipes.